The New Horizons Multicolor Visible Imaging Camera (MVIC) took this image of Jupiter's volcanic moon Io at 04:30 Universal Time on February 28, 2007, about one hour before New Horizons' closest approach to Jupiter, from a range of 2.7 million kilometers (1.7 million miles). Part of the Ralph imaging instrument, MVIC is designed for the very faint solar illumination at Pluto, and is too sensitive to image the brightly lit daysides of Jupiter's moons. Io's dayside is therefore completely overexposed in this image, and appears white and featureless. However, the Jupiter-lit nightside of Io and the giant plume from the Tvashtar volcano are well exposed, and the versions of the image shown here have been processed to bring out each of these features. The scale of the original image is 53 kilometers (33 miles) per pixel; Io itself has a diameter of 3,630 kilometers (2,250 miles). The nightside of Io (left panel) is illuminated brightly enough by Jupiter to reveal many details in full color to MVIC�s sensitive vision. The nightside color has been corrected to account for the greenish hue of Jupiter's light as seen by MVIC � see the April 2 Featured Image of Io and Europa � so the colors approximate what the human eye would see in daylight illumination. The image shows Io's reddish-brown polar areas and the yellow and white colors of its equatorial regions, mostly due to various forms of sulfur. Several dark volcanic centers are also visible � the most prominent, appearing as an elongated spot just above and to the right of the disk�s center, is called Fjorgynn. Near the disk center, just over the night side of the terminator (the line separating day and night), is a row of three or four pale yellow patches, which likely are volcanic plumes catching the setting sun. These features have caught the attention of New Horizons scientists because no major plumes have been seen previously in this region of Io, and it is rare for Io's plumes to cluster so closely together. The right panel shows the bluish color of the plume from Tvashtar, rising above the overexposed edge of Io's disk at the 11 o'clock position. The plume is blue because it contains fine dust that preferentially scatters blue light, in the same way that smoke appears blue. The red line on the edge of the disk, below the plume, is an artifact caused by the overexposure of Io's surface. The image is centered at Io coordinates 26 degrees west, 6 degrees south, and is produced using MVIC's blue, red and near-infrared filters. 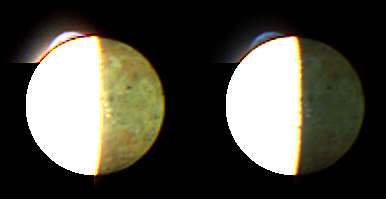 In the original image, the overexposure of Io's dayside hemisphere caused extensive electronic �blooming� of the image toward the left and bottom edges of the frame, and this has been removed from the versions shown here.